Click the appropriate link below for . . . The varsity tennis team advance through the UIL Team Tennis playoffs by going undefeated in district 17AAAA and the 17/18 4A area tournaments. 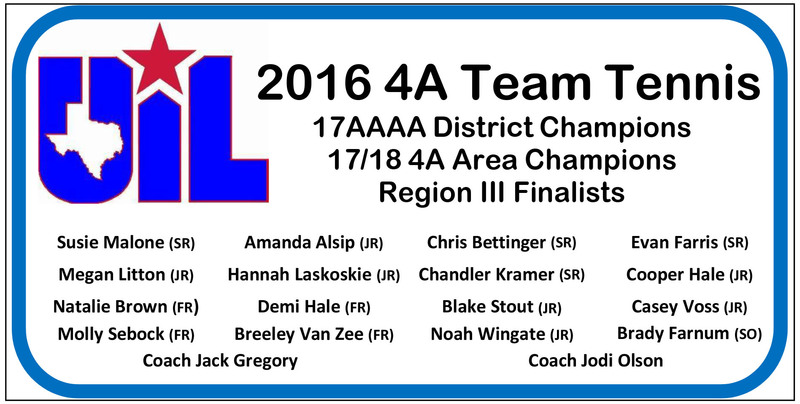 As Area Champions, the team competed in the Region III 4A regional tournament in Bryan. The Rockets defeated Needville 18-1 in the opening round and moved into the semifinals to take on Lampasas. In a 4 ½ hour match, the win came down to the last 3 matches on court. RHS fought through and won all three matches to win the team match 10-9. In the finals, RHS faced off against Wharton and had another long, tense battle. Needing to win the last 3 matches on court for the 2nd time, the Rockets came up just short of their goal. Although having won the first set in two of the matches, Wharton took the first match off to clinch the regional title with a 10-7 score. 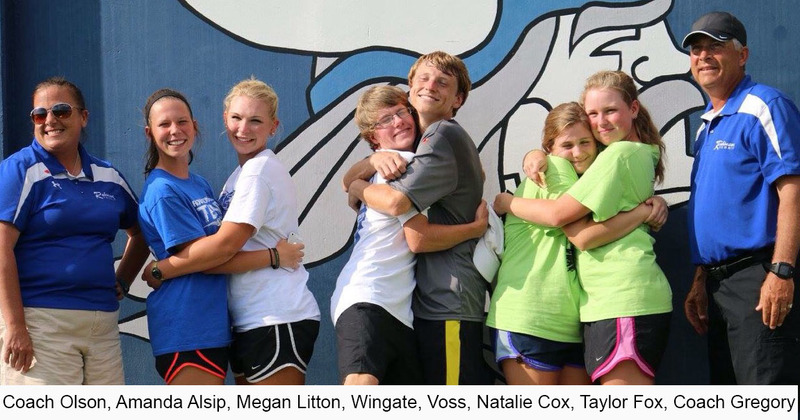 (back) Coach Jack Gregory, Chris Bettinger, Noah Wingate, Cooper Hale, Chandler Kramer, Evan Farris, Hannah Laskoskie, Megan Litton Demi Hale; (middle) Susie Malone, Brady Farnum, Coach Jodi Olson, Blake Stout, Casey Voss, Amanda Alsip; (front) Breeley Van Zee, Natalie Brown, Molly Sebock. Wingate Takes Silver at State! Congratulations to Noah Wingate, RHS sophomore, for his tremendous year in 4A tennis! After losing in the semifinals as a freshman, Wingate pushed forward another step in his quest for an elusive state championship by advancing to the 2016 4A boys' singles final. 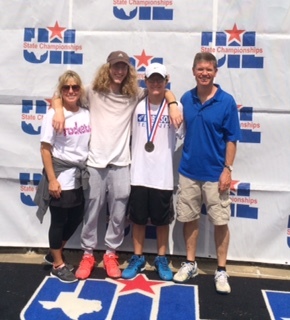 Although he lost in the finals, Noah finished the year as the UIL State Runner-up with a final singles match record of 48-6 for the year. Casey Voss, also a RHS sophomore, completed his year as he took a 3-set loss against the eventual state champion. Although he lost his match in the quarterfinals, Voss was the only player to win a set from the state champion through district, regionals, and the state tournament.. He represented the Robinson community, his team and Robinson HS extremely well. Congratulations to both young men! 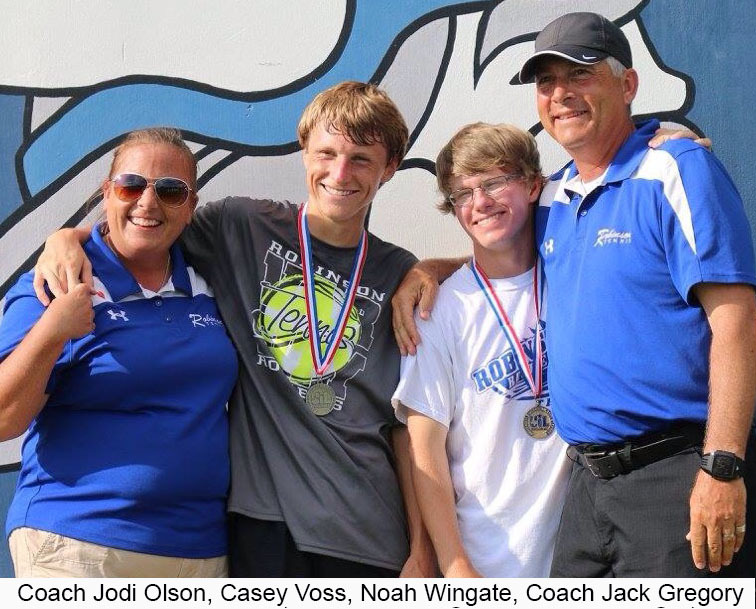 Robinson HS will send a two-edged sword to the UIL State Tennis Tournament in the form of boys’ singles powerhouses Noah Wingate and Casey Voss. Dominating the Region III tournament in Bryan, Wingate earned his second straight appearance in the elite state contest. Recognized as the top player in the tournament, Wingate received a bye in the first round as the #1 seed. Noah took out the #1 player out of Jasper HS from 20AAAA in the quarterfinals 6-0, 6-1. Semifinal round action pitted Wingate against the #4 seed from Bridge City and the Robinson HS sophomore quickly won 6-1, 6-2. This set up a showdown with teammate Casey Voss, also an RHS sophomore, in the tournament finals. Voss, seeded #2 in the tournament also had a first-round bye. His quarterfinal match ended quickly 6-0, 6-0 as he dominated the 23AAAA winner from Huffman/Hargrave HS. Facing the #3 seed from Henderson HS out of district 19AAAA in the semis, Casey started fast by winning the first set 6-2. He hit a bit of a wall in the 2nd set with his consistency, but regained control taking the second set 7-6 with a (7-0) set tiebreak. The regional final match was the fourth tournament finals in which Wingate and Voss had to face each other. Voss pushed Wingate harder than any other player but eventually fell 2-6, 3-6 as Wingate celebrated another Regional Championship. Voss, facing the Bridge City player in a playback for 2nd place, quickly dispatched the challenger 6-1, 6-1 to claim undisputed 2nd place. Casey was able to celebrate his first chance to compete in the upcoming state tournament. Both RHS players will compete against the state’s best 4A players in the Texas State UIL 4A Tennis Tournament to be held at Texas A&M in College Station on Monday and Tuesday, May 16-17, 2016. Also participating in the Region III Tennis Tournament were seniors Natalie Cox and Taylor Fox in the girls’ doubles draw. The RHS duo won their first-round match by defeating 23AAA’s winners from Splendora in split sets 6-2, 2-6, 6-2. A loss in the quarterfinals to Bellville ended a superb year for the young ladies. Megan Litton and Amanda Alsip also competed in the girls’ doubles event but lost to Center 6-3, 4-6,4-6 in the opening round.